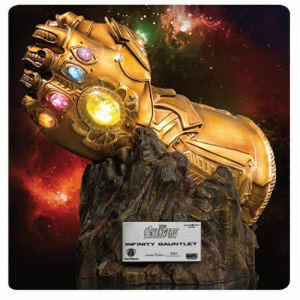 Be sure to get your Marvel Infinity War Infinity Gauntlet MC-004 Replica Statue - Previews Exclusive hot of the truck! Fill in the Notify me when Available and you will be the first on your block to have a Marvel Infinity War Infinity Gauntlet MC-004 Replica Statue - Previews Exclusive !! From the Avengers Infinity War collection by Beast Kingdom. Marvel Infinity War Infinity Gauntlet MC-004 Replica Statue - Previews Exclusive. The Gauntlet is a 1 to 1.5 scale replica with a built-in LED that lights up and dims at the rhythm of breathing. Gauntlet includes a sculpted meteor display base. Previews Exclusive individually numbered and comes with a certificate.